MELVILLE, NEW YORK, May 21, 2014 - FONAR Corporation (NASDAQ-FONR), The Inventor of MR Scanning™, reported that after being diagnosed in November 2012 on the FONAR UPRIGHT® Multi-Position™ MRI (aka STAND-UP MRI®), former NFL quarterback, Jim McMahon, who suffered from post concussion dementia, was able to receive appropriate treatment and that his symptoms have resolved. Jim McMahon, the former NFL quarterback who guided the Chicago Bears to victory at the 1985 Superbowl, has benefited from having used the FONAR UPRIGHT® MRI scanner at FONAR's Melville corporate headquarters. Former Senior Vice President, David Terry, whose duties included managing the Company’s Sports program, became aware of Jim McMahon’s health concerns from prior football concussions, from the Sports Illustrated, September 2012, cover story on Jim. Jim had severe headaches, body pain and other debilitating symptoms. Mr. Terry thought that FONAR's new technology for making cinés of the cerebrospinal fluid (CSF) as it flows in and out of the brain when the patient is in the Upright position might be able to help Jim. Through a mutual friend, He contacted Jim and scheduled him for an UPRIGHT® CSF flow study at FONAR's Melville MRI facility. The FONAR UPRIGHT® CSF flow video demonstrated a significant obstruction of CSF flow and increased intracranial pressure secondary to prior football injuries to Jim's neck (cervical spine). Subsequently he was treated by Dr. Scott Rosa, of the Trauma Imaging Foundation, www.traumaimagingfoundation.com . Dr. Rosa treated Jim with his patented IGAT (Image Guided Atlas Treatment) method. Jim gives much credit to Dr. Raymond Damadian, M.D., president and founder of FONAR, the FONAR UPRIGHT® Multi-Position™ MRI (Stand-Up® MRI) and Dr. Scott Rosa, for the wonderful elimination of his pain. His experiences are reported and found online by The Stamford Advocate (Jan. 17, 2014) and The Yankees Yes Network. 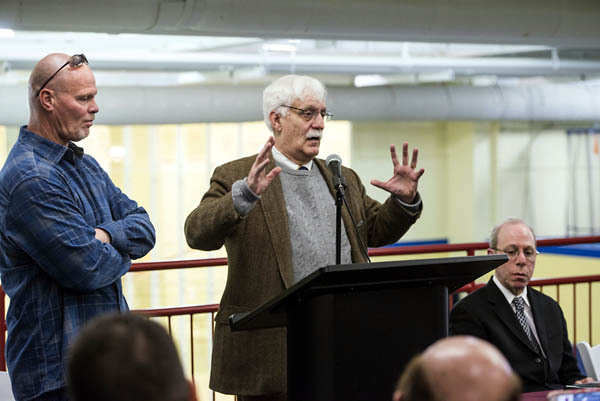 Jim McMahon, former Chicago Bears quarterback (standing on left) at Chelsea Piers, Stamford, CT on Thursday, January, 16, 2014; Dr. Raymond Damadian, president of FONAR Corporation and the inventor of the MRI (Magnetic Resonance Imaging) scanner (standing in center); and Dr. Scott Rosa a cranio-cervical specialist (sitting on right). They presented the new technology, done on the FONAR UPRIGHT® MRI, for visualizing the adequacy of CSF flow in patients with neurodegenerative disorders when they are in the UPRIGHT® position, and Dr. Rosa’s technology for treating patients with impairments to their CSF flow. 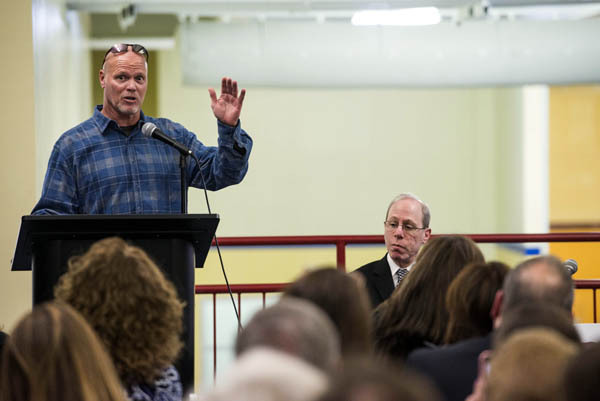 Jim McMahon, speaks to the audience at Chelsea Piers, Stamford, CT on Thursday, January, 16, 2014. UPRIGHT® and STAND-UP® are registered trademarks and The Inventor of MR Scanning™, Full Range of Motion™, Multi-Position™, Upright Radiology™, The Proof is in the Picture™, True Flow™, pMRI™, Spondylography™, Dynamic™,Spondylometry™, CSP™, and Landscape™, are trademarks of FONAR Corporation.